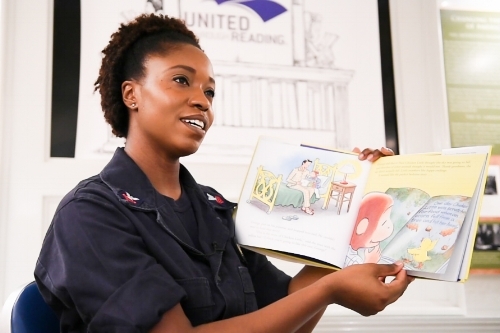 United Through Reading, a nonprofit organization, connects military families through stories read aloud on video. When we talk about military families and the challenges they face during deployments we often envision the 3-year-old boy who misses his mom and doesn’t understand why she is gone, or the service member who is missing out on special moments, like birthdays, with the family at home. What we sometimes don’t always consider is the hardship of the at-home caregiver doing it all solo during deployments. The primary caregiver at home bears some tough burdens during deployment as they react to the emotions of military children and provide comfort, strength, and stability while a military parent is away. Veronica is a Navy wife of more than 15 years. Over the course of her husband Rex’s career, they’ve spent more than four years apart. They have four children who have also endured this time away from their dad. Veronica has taken advantage of several resources for military spouses, but one of her favorites is United Through Reading (UTR), a nonprofit that connects military families through the read-aloud experience by video-recording services members reading books to their families at home and shipping the video and book home to keep them connected. At first, Veronica thought the video was just for the kids to stay connected to their dad, but she soon realized it was a gift for her as well. United Through Reading supports military caregivers and the entire military family. Learn more about United Through Reading by visiting them at their links below.